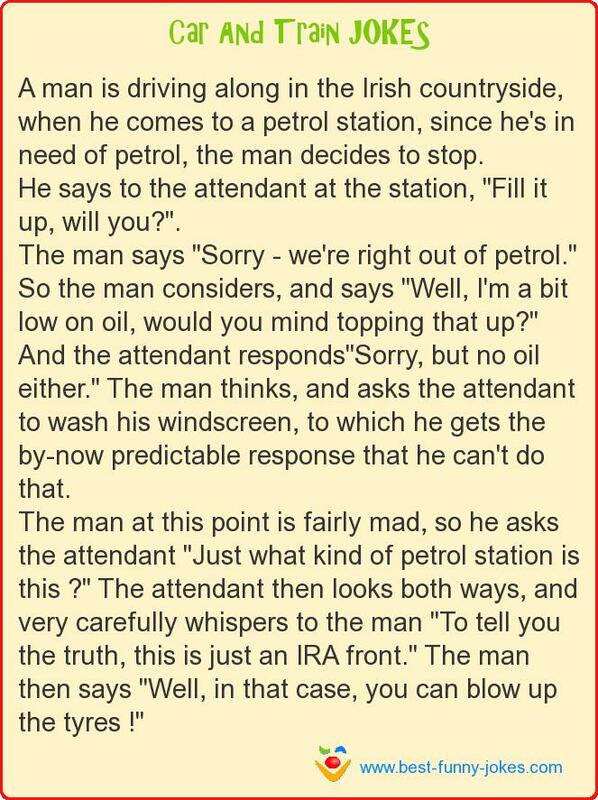 A man is driving along in the Irish countryside, when he comes to a petrol station, since he's in need of petrol, the man decides to stop. He says to the attendant at the station, "Fill it up, will you?". The man says "Sorry - we're right out of petrol." So the man considers, and says "Well, I'm a bit low on oil, would you mind topping that up?" And the attendant responds"Sorry, but no oil either." The man thinks, and asks the attendant to wash his windscreen, to which he gets the by-now predictable response that he can't do that. The man at this point is fairly mad, so he asks the attendant "Just what kind of petrol station is this ?" The attendant then looks both ways, and very carefully whispers to the man "To tell you the truth, this is just an IRA front." The man then says "Well, in that case, you can blow up the tyres !"